Day 115: Zero in Butte! Oh man, what a day! I am closing in on Canada and I know all of you can feel it cause I got a flood of emails and calls today! Many asking if it’s too late to send anything. Well, sadly it is unless you want to send it directly to the East Glacier location listed on my Care Package tab…but I already have more than I can possibly carry coming there. Good news is that I’m zeroing there. Some of you have asked about monetary contributions instead and that is still okay to send to my Illinois address and my dad will make sure it gets to me. Whew! Hopefully that will cut back on all these emails. So great that everyone is excited and pumped about the hike though! It is helping to really get me pumped too, so thanks! I spent most of the day on my laptop doing three things…blog work(never seems to end! ), hours of online yearly trainings for the districts I sub teach for, and downloading audiobooks for this next leg. 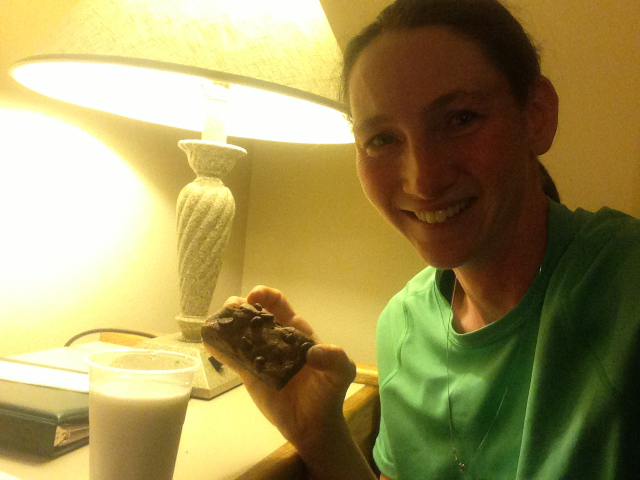 I managed to take some breaks to eat everything at the free hot continental breakfast and also for brownie breaks! My aunt Linda sent the best batch yet which are Mrs Fields brownies! I have to say that it’s quite a perk that I get to eat so many of these and not worry about gaining weight. Thanks Linda! My brother and his family live an hour from Butte in Bozeman and I got a text from my sister-in-law that she and my nephews could come over for dinner, yay! My brother had to work and we didn’t need another bear spray incident, ha! Actually, we are still hoping to get him and possibly the family out on the trail again before I finish. I hustled to get everything done and just before they arrived a bunch of hikers also arrived at the hotel. It was Dain, Sweet As, Aquaman, Balls, and Sunshine. All of them are 1-3 days behind me, but will catch up soon. There are multiple ways to get to Butte from the trail and they just exited earlier than I did. We all get back on trail tomorrow in our respective locations. Dain’s mom is here and will be getting up early to give us all rides to where we need to be. So great! I know many of you would love a pic of me with Balls and Sunshine, but our crossing was very brief as they were in the pool as I headed to dinner with my family. 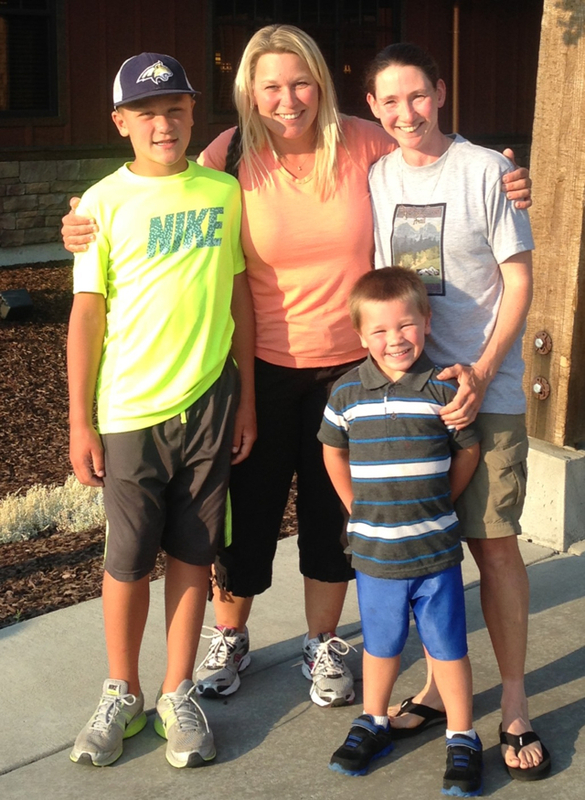 My nephews Brooks (10yrs) and Sam (4yrs) and my sister-in-law, Dana. 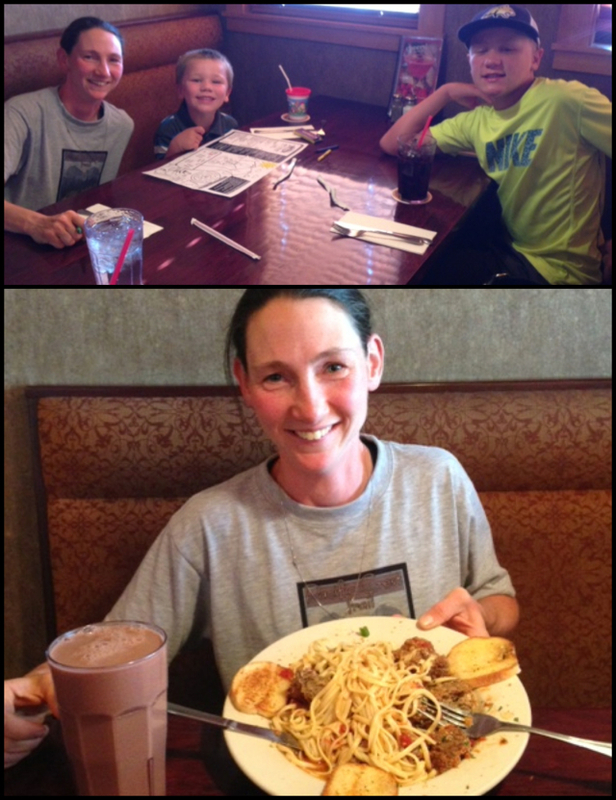 We ate dinner and I got my heaping plate of pasta with chocolate milk of course! 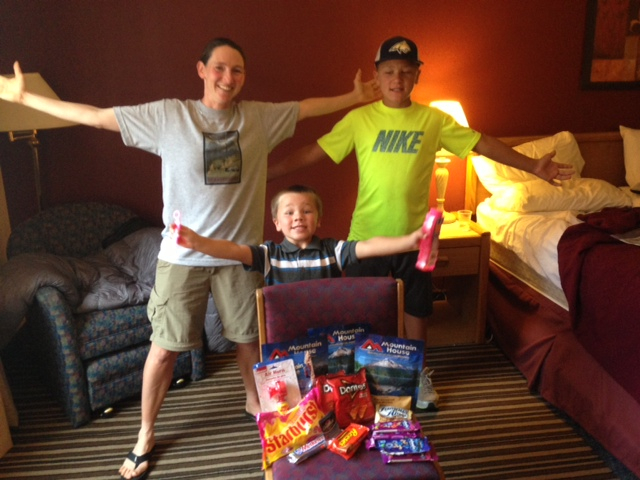 Then we headed back to my king sized abode and my nephews helped to display my care package gifts with the classic Wired pose. Little Sam cracks me up! I got some great stuff and want to thank Edie, George, Cowpie, Corinna, Heart, Frank, Mule, and Dan. A special shout out to Steph who sent some fun things like Starbursts, and air horn(for bears ha! ), and bubbles. Perfect timing as my nephews were able to partake in the fun! You can see Sam was quite excited about the bubbles. 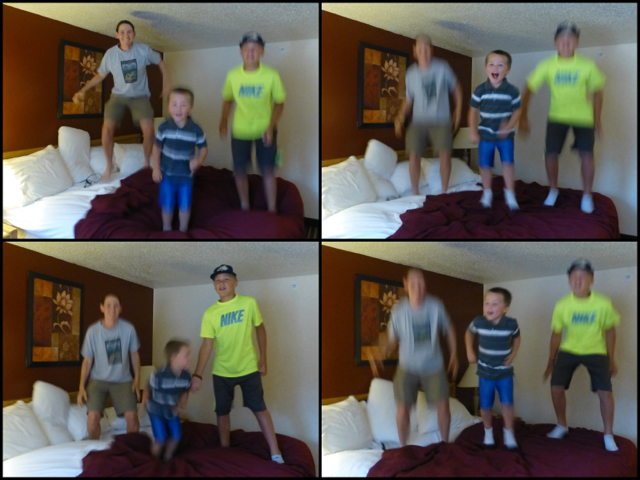 Of course, we couldn’t resist jumping on that king bed…It was just asking for it! 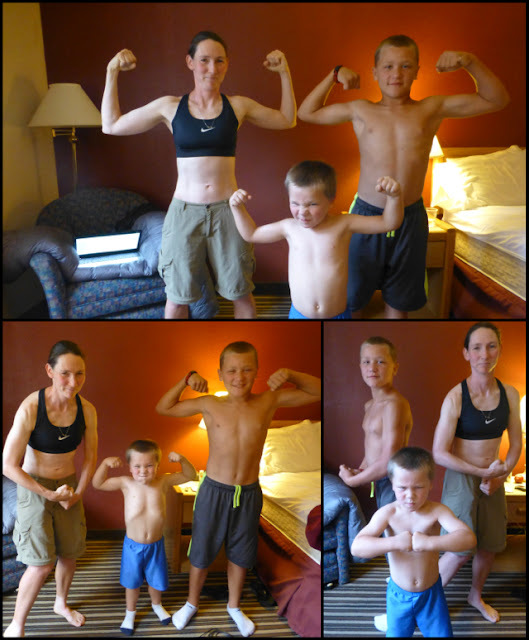 And these muscle shots are great! Hey, I’m never gonna look like this again, so I need this documented! It was such a great time and really took my mind off things for awhile. So glad they were able to make it out and it will be fun if they can make it again. I was up past midnight doing some last minute loading of audiobooks. I ended up getting the “Prodigal Summer” and “Flight Behavior” by Barbara Kingsolver, “Empire Falls” by Richard Russo, and “The Absolutely True Diary of a Part Time Indian” by Sherman Alexie. A special THANKS to Dirty Girl(www.dirtygirlgaiters.com) for the audible subscription to help load some of these! Okay, off to bed. I will totally regret this in the morning!